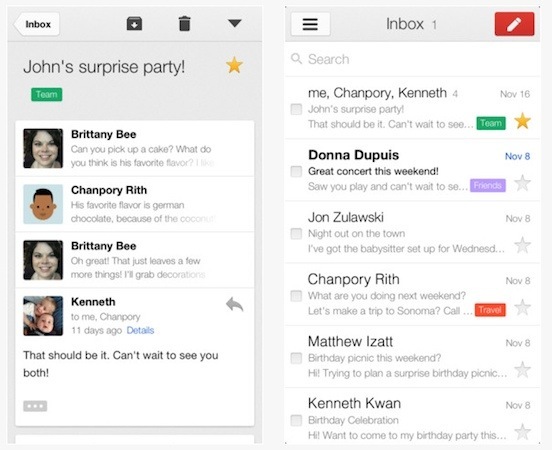 So I’m sure if you are a Gmail user you know that Googles mail client has been updated on Desktop and Android. Well now those of us who use iOS are finally recovering the update. The update is available now from the App Store for both iPhone and iPad and brings with it not only the category-based and multiple tab inbox but also offers the ability to set notification options for individual accounts. This update finally brings it in line with other platforms and is an absolute pleasure to see and use. When using multiple accounts you are now able to set notification options for each individual account. You can be notified for all messages, only important messages or none at all. If the new tab interface is to much for you to handle Google have included the ability to turn it off and that’s not all Gogle have included, you can now view YouTube videos and Google maps through the appropriate app rather than on your browser. If the Android update is anything to go buy it will roll out in stages so keep checking back if its not available for you yet. The download link is below as usual so go get your update on.